Using the freshest local ingredients, our food will fill you full and with regular live music too, we’re the perfect place to meet friends and catch up. Simply gid! Friendly relaxed atmosphere and great food. This place is well worth a visit. Dogs allowed in downstairs area and in the hallway upstairs. We had the breakfast which was amazing!!! Huge portion, locally sourced produce. The hallway is so quirky, I love vintage. Staff are very friendly too. 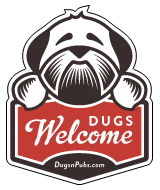 My first search within dugswelcome.com did not disappoint. Lovely atmosphere, great food and coffee, very welcoming staff and most importantly very dog friendly. Dogs aren’t allowed in the main section of the cafe upstairs, but the ‘hallway’ section is incredibly cozy and the whole basement bar area is also a dog friendly zone.